I've just finished Brandon Sanderson's Mistborn trilogy, so this post comes with another minor spoiler warning - while I won't tell you exactly what happens no doubt it will be enough to bother some. 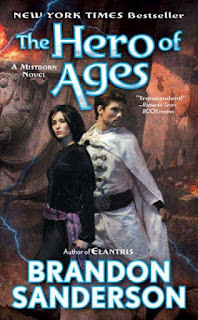 Hero of Ages uses several point-of-view characters who are far more spread out than in previous books, and their stories are not bound so tightly together as in the first two books. Each plays a part in the big picture but the parts are more distinct. Although I initially found some more engaging than others they all eventually came into their own. Several of my concerns from Well of Ascension appeared to be coming over into Hero of Ages. After a while these began to lessen and the pace of The Final Empire started to reassert itself. Examination of the internal musings of characters did not disappear - but thankfully were no longer repetitively focused on feelings and insecurity. One character did continue this to a degree I consider excessive, having finished the book I can see why, however still consider it to have been overdone. Recap wasn't entirely absent either, but was done with reasonable restraint, and shed new light on things rather than simply repeating. Events from the end of The Well of Ascension appeared to be producing the imbalance that I thought they risked, but as with my other concerns, these sorted themselves out. When the major revelations started coming I found the book far more engaging and enjoyable and thankfully, unlike Well of Ascension it began to pick up the pace. Some revelations were at least partially predictable and gave me the sense of satisfaction from working something out - others completely blindsided me. At the end of chapter seventy-two I realised that there was no chance whatsoever of putting this book down. One of the revelations I had been suspecting was thrown out into the open, proving my suspicions but on a far grander scale than I had been expecting. From here ploughed straight on to the end without so much as looking up from the page. I was left with a fantastic sense of satisfaction, my mind continuing to process and expand ideas. I couldn't help but draw comparison with David Eddings' Belgariad and Malloreon series. Shortly after finishing Hero of Ages I realised that there were noticeable similarities in the theological goings-on. The execution and detail of these, however, is sufficiently different that I would not call this a flaw, just an interesting comparison. The Mistborn trilogy's greatest assets would have to be the magic system and how carefully planned it appeared to be - even at the end of this trilogy it is clear that not all has been told, but everything fits together perfectly. The initial description of the magics at play seems logical and well understood, but time and time again the characters find they have more to learn and that it is far bigger than anticipated. This does not feel, as it can in some series, as if the author has tacked more on. Bits and pieces of story from earlier on support every new revelation allowing you to see earlier events in a different light. The Final Empire looks very different once the revelations of Hero of Ages are considered and I am very tempted to re-order the book from the library to see what other implications I did not realise were there before. Although the middle of the Mistborn trilogy was decidedly lacklustre the beginning and end make it one of the best new fantasy series I have read in a long time. 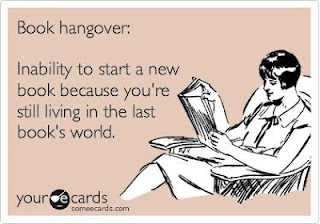 I think I am experiencing a book hangover. I have already got my hands on a copy of another book set in the same world - The Alloy of Law is set many years later and from the author's notes at the beginning, is a side book rather than the opening of a new series. There notes also suggest that there may one day be three trilogies set up in this world in different time periods – if so I will look forward to reading those.